Log homes have come a long way from being ancestral and ancient, and now it is even possible to give a log home look to your very own house with the help of log look vinyl siding. There is something nostalgic about log homes that takes you back to old times, refreshing memories of ancient villages and settlements. Nowadays, building a real log house sounds impossible due to various reasons. The first and foremost reason being the environmental issues relating to cutting of trees. Another reason is the cost of wooden logs, which demand a higher level of maintenance, as compared to other types of house siding. But now, there is an alternative to wooden logs, which is cheaper and requires less maintenance. This siding material, which can imitate the feel and look of real wood, is known as log look vinyl siding. What is Log Look Vinyl Siding? Vinyl log siding is the perfect siding material for those who love the looks of a log house. This particular material is made of vinyl, but mimics wood in appearance. With their rounded off corners, this siding imparts the authentic look of a log cabin. This vinyl siding is made of chlorinated polyvinyl chloride (CPVC) with insulated foam backing, that fills the shape of the panels. The rigid polystyrene insulation offers strength to the siding. As in the case of real wood siding, this insulation part of log look vinyl siding helps in maintaining temperature by preventing heat loss in winter, and heat gain in summer. As per the manufacturers, this siding has soundproofing properties and also reduces air leaks and water infiltration. This type of vinyl siding is available in different designs, but those which mimic the looks of pine and cedar are the most commonly used ones. The other options are harvest brown and timber wolf gray. Nowadays, vinyl log siding panels are also available in the market. These panels are easy to install, as they have at least three logs in a single panel. 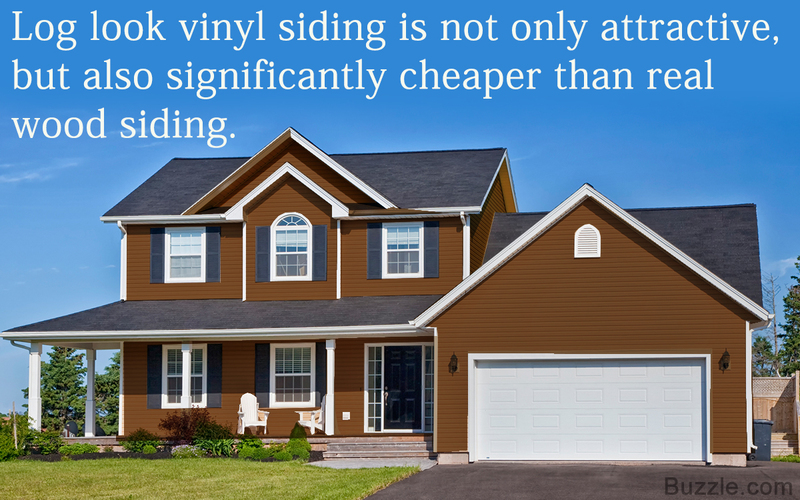 • This vinyl siding is significantly cheaper than real wood siding. • It is also lighter and installing this vinyl siding is easier, when compared to other types of siding materials. • Unlike wooden siding, vinyl log siding is not prone to corrosion or splintering and is also not attacked by pests, insects, mold, mildew and moss. • With all these features, log look vinyl siding is almost maintenance free. • This siding is weatherproof, protecting the construction from all climates. • As compared to certain other types of siding, like steel ones, vinyl log siding is not prone to dents, even during hailstorms. • Even though, it comes in a wooden finish, it is possible to paint this vinyl siding, which can retain its shine for years. • All you have to do is to wash the siding with a hose or a power washer two to three times a year, in order to maintain the look. Though vinyl log siding is cheaper than real wood, it does not mean that this siding material is really cheap. Most of the manufacturers provide the cost of this siding material, per square foot or lineal foot. But, it is always better to accurately measure the area to be covered and get a quote as per those dimensions. Compare the rates from different manufacturers. These sidings too come in different qualities and the cost may vary as per the product too. While some of them have special ultraviolet coating for extra durability, some others look more authentic (like real wood). So, you must have a basic understanding about the different types of vinyl log siding, their features and their pros and cons. Once you understand more about the products, compare their prices. While doing so, take into consideration, other factors like quality and features. It is said that even if the price of log look vinyl siding appears high, it may not cost you heavily as it is easy to install them and they require minimum maintenance. However, some of the users feel that this siding may not have the surface character of real logs, if you inspect them closely. If you want a rustic look for your house and are not in a position to afford and maintain wooden siding, then this vinyl siding is the best option. It can be installed with the help of a professional or you can do it yourself, according to the instructions given by the manufacturer. Most vinyl log sidings come with a warranty of up to 20 years, while some of them offer a lifetime warranty. This siding material can be used for new constructions, for remodeling and to replace old and damaged wooden sidings. The above said is only a brief overview about log look vinyl siding and so, it will be better to seek the opinion of experts, before choosing such products.